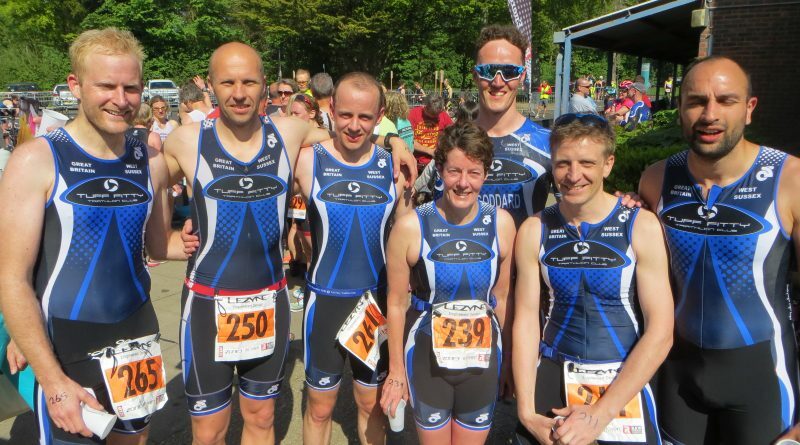 Tuff Fitty were out in force at Steyning Triathlon which represented our Sprint Club Championship race for 2018. Unfortunately there were a couple of entrants who had to withdraw through injury otherwise we would have been the largest club contingent present. However when marshals, Tuff baby brigade, & cheerleaders were added in, Steyning proved to be a another great Tuff morning in the sun. 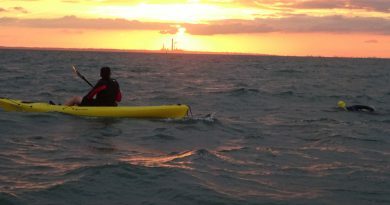 It was an early 6 am start as five Tuffs lined up for the standard distance race. First Tuff home was Stephen O Donnell in what proved to be a smaller field than usual. However with the warm weather it was useful to complete the bike leg prior to the roads getting clogged with traffic heading to the beach. Stephen would nab the fastest Tuff bike split of 1 hour 1 minute over the 36km course. Olly Sampson was next, he was pleased with his time and his shaping up very well for Ironman Nice in seven weeks time as the above photo shows. His training was demonstrated to good effect with the fastest Tuff swim split of 13:56 for the 800m. Andy Vincent was third Tuff home just over the two hour mark. 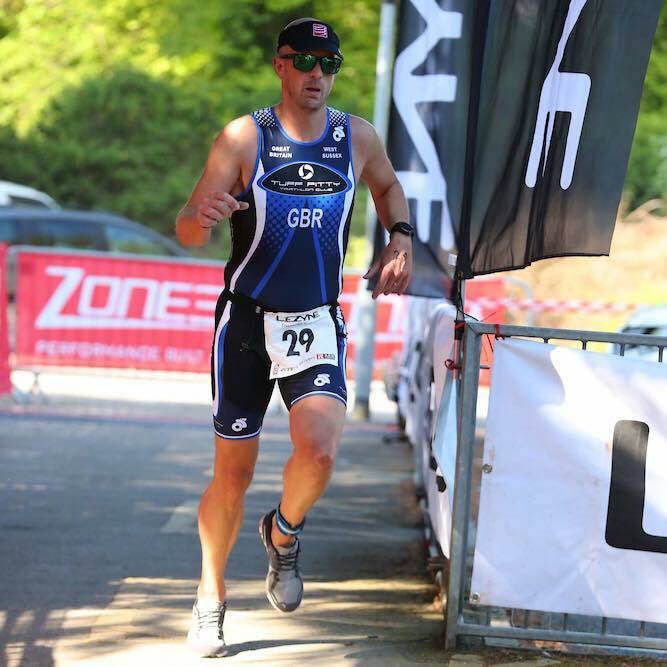 Pete Littleboy has spent a lot of time riding over to run races and this was reflected in a time almost three minutes quicker than last year. Simon Thistlethwaite completed the quintet in style with his trademark rapid run with a 35:22 10k. Well done to several Tuffs who were up very early to assist with the event; Gary Locker was busy marshalling, Andy Ward commentating, Miki Floyd was on registration and Trevor Harvey in charge of transition. In the pool it was a Tuff lockout with Clive Harvey swim starter and all the lane counters Tuffs – Debbie Boxall, Bex Lintott-Clarke, Drew Gowland & Tom Frith. Thanks to all the Tuffs who turned up to cheer. Next up was the club sprint championship of a 400m swim, 20km bike and 5k run. This would prove a very competitive affair amongst the 15 members of the Tuff squad. The banner shot was captured after seven of the Tuff sprinters had crossed the line. Captain Joe Pascoe has been concentrating on longer distance with his marathon, but easily slotted back to sprint crossing as first Tuff with the fastest Tuff run leg in 55:39 – this placed him 6th overall. The good news didn’t end there with Ollie McDonald carrying over his strong form from last year finishing in 8th position. Tom Goddard was just 33 seconds behind to finish ninth overall with his scorching 5:56 swim – 3 Tuffs in the top ten – brilliant. Matt Whittaker was justifiably proud as not only did he finish in 11th overall he picked up a trophy for second in his age group. Andy Crawford punched out his usual rapid run to finish 15th overall. Tom Gray finished in 30th position and welcome back to Mike Barrett in 31st. “What a beautiful day for a triathlon, and the first of the season I was a bit apprehensive as my training has been struggling due to injury, but when I arrived and saw how chilled everybody was, I got myself sorted and headed for the pool. It was a good swim leg and then off on the bike without putting a jacket on which is a first for me. The bike went smoothly and the hills just disappeared, I really am enjoying the bike. Back to transition and I could not find my stuff, typical error going down the wrong line. Then it was out for the run which I was taking slowly as I have not run for 3 months, but once I got going nothing was hurting so I settled in and enjoyed the weather and before long I was at the finish, glad to complete and a benchmark set for the next one”. 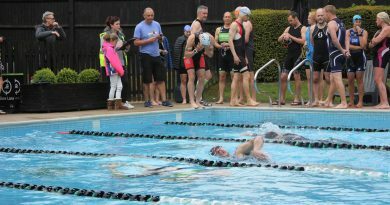 “Once again I took part in the local Steyning standard distance triathlon. Personally I love this event as not only does it kick off my tri season but it always has a good Tuff turnout in competing and marshalling, even spectators coming from far a field. It’s also a club championship in the sprint distance, so all this with the club discount makes it so worthwhile financially. However the weather in previous years have been off putting but not this year; it was lovely, without a cloud in the sky and saw myself (2:03) and other club members getting pb’s in a 800m swim and a undulating course with a 36k Bike (22miles) and finish with a 8k run (4.9miles). It’s a shame it’s not closed roads but with a 6am start most competing are done before the traffic gets to bad. Don’t forget the next Club Championship race is the Standard distance championship at Worthing – held on Sunday 8th July – To save money on the entry us the Tuff discount code. Not got it? email clive.harvey@tinyworld.co.uk who will send on.